The one on the left is Belial, the one on the right-- Duane. I dig the pattern, and as always love the Kona Superwash... though I'm not sold on the color combination here. (I outlined what I did to get these colors and stripes in this post.) The stripes didn't get too lost in the pattern stitch, either. The socks weighed in at 120 grams exactly, cutting it super close except that I dyed this batch in 4.5oz increments-- given my ability to cut it way too close (or not at all) with the Kona. The cuff is about 7" long (including the 2" k2, p2 rib at the top)... you can keep the cuff shorter by cutting the ribbing at the top down if you're worried about running out of yarn-- the pattern is stretchy enough to keep the sock up on the leg no problem. (Fwiw, I have a 9-9.5 women's foot). I like the look of the 2" rib at the top though, its unusual. I did wonder if I really *did* use less yarn using combined knitting for the purl stitches... a cheapskate way to save yarn? :) I am happy with the result though, and will defintely use it again for ribbing-- either in the round or not. 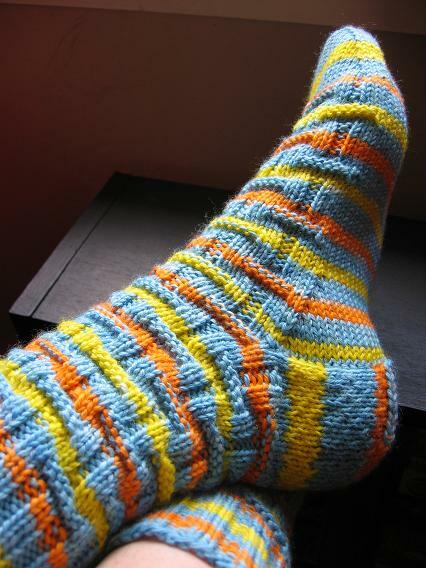 I'm trying to convince myself to pick up the entrelac socks again... I realize I didn't cast on the top loosely enough and since its a long cuff, its a bit tight at the calf. I'd really hate to frog them for all the work that has gone into them already... Ergh. I really really like the look of the the Broken Cable Rib socks from the Interweave Knits subscriber section... they didn't really stand out to me til I saw them knit up on Knitting the Blues and was super impressed how they turned out in the lighter yarn-- the broken cable pattern really stands out. 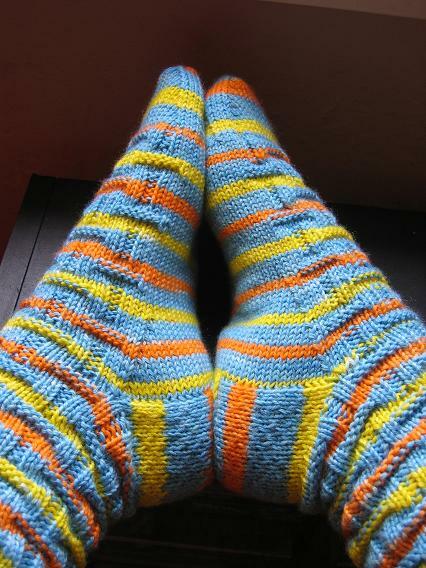 If I knit them, it'll be on 2 circs to combat second sock syndrome... I'm thinking cherry tree hill supersock or nature's palette-- don't know if I have enough NP to make it though-- the pattern calls for Regia Fadig 4 ply, 230yd/50 gm... the Hand Jive Nature's Palette yarn is 185 yd/50gm... I think they'd look great in the light purple NP I brought back from the Knit and Crochet Show, though... maybe I'll push it or work a short row heel (I've been wondering if they do use much less yarn than flap heels do?)... don't really want a contrasting heel/toe though. I also want to knit Hedera, but the yarn I'll use (Cherry Tree Hill Supersock in a green colorway) still has beads on it... I frogged the beaded Glad Ragg sock from the Yahoo Six Sox Knitalong group, and for some reason I haaate dragging the beads across the yarn so just haven't done it. Cara said she beaded her amazing Diamond Fantasy Shawl using a crochet hook instead of prestringing... which would open up like a world of possibilties, don't you think? love love love those basketcase!! it is super inspiring. I like the Entrelac idea, but maybe in a more inspired yarn? 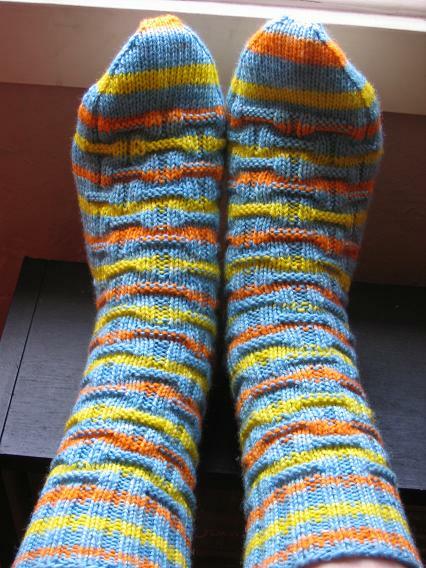 Too bad Noro does not have sock yarn. you have some fab stash to pick from. The socks look great (I like the colour too)! I just love that pattern. The socks look great! I love the way the Paas yarn turned out! Your socks look wonderful ... thanks for knitting them up. It's nice to see them in other yarns. But dude, you name your socks? Great looking socks! I'm impressed with the vibrant colors and how the stripes didn't get lost in the basketweave. Yummy. I LOVE your twn socks! How did you come up with the names? I'm really impressed with how well your hand dyed stripes came out! Your socks look fantastic! That pattern is great. I've been working on a couple of projects using a crochet hook to add beads, and I'm really enjoying it. Another great benefit of using it is that the bead is equally visible from both sides of the fabric- not so important on socks, but great on shawls or scarves. I printed out that Basket Case pattern after I saw how it was knitting up! I love it with the stripes - different! I can't wait to get some dyes this weekend and divvy up my HA cone! those are adorable! I love that heel! Thanks for the tip about the Addis and for your kind words about my socks. 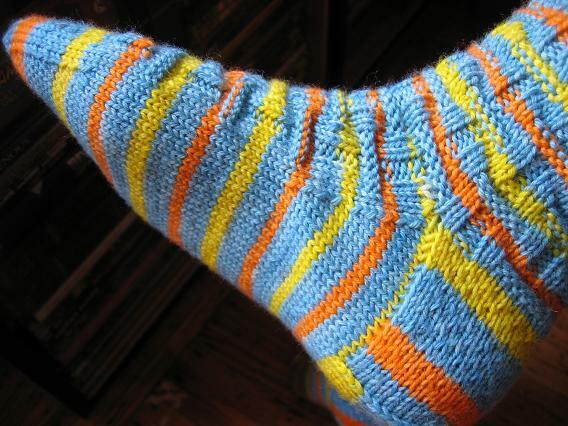 I love your blog and find your sock knitting inspiring. I find short-row heels challenging and though they're getting better, I'm always looking for a better method. Do you have a favorite heel? I love the basketcase socks! The colors are great. I'm always a fan of crazy colors. Those socks look great, I love the pretty colorways you're getting with the egg dyes! And that light purple NP would be wonderful for those IK socks, really nice pattern.